Between preparing for the release of the new Deer&Doe collection and feeling a bit tired lately, I haven’t even touched my sewing machine in a month, and I miss it a lot. 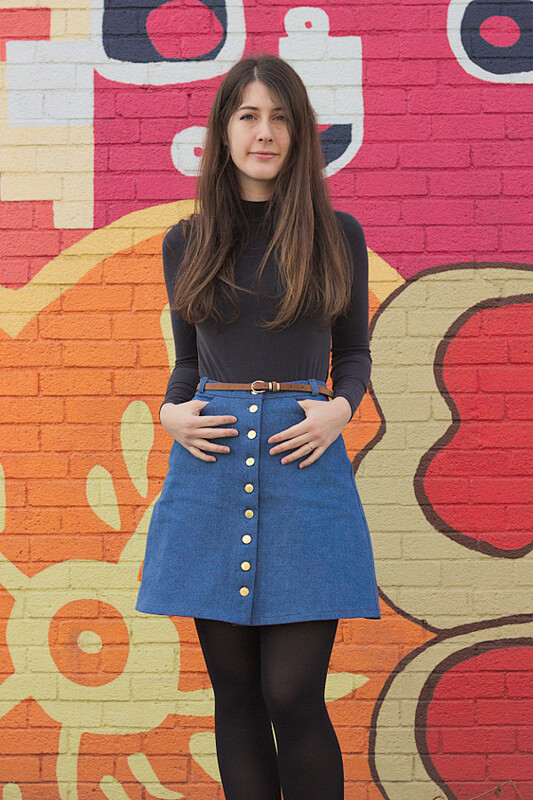 However I still have one project to show here, that I managed to finish just before heading back to France: a denim Paulice Alice Rosari skirt. I was pretty surprised to realize it was my first time sewing Pauline Alice’s patterns! 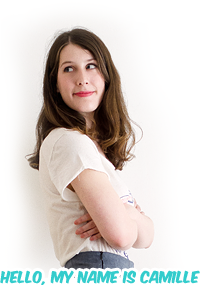 I love her modern take on vintage classic styles and I’ve been following her work for a while, and I even bought several of her patterns (my favorite are the Cami shirtdress and the Sorell trousers). I don’t know why it took me so long to get started! 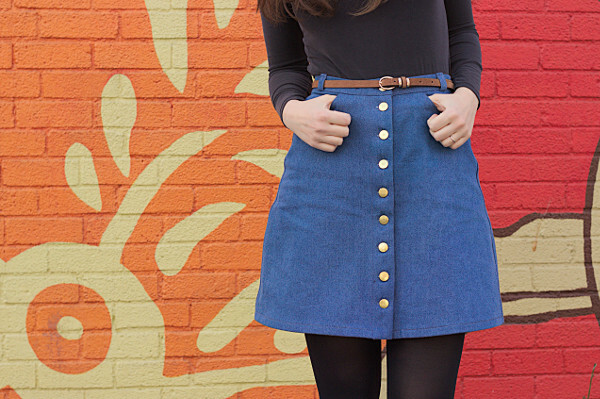 There was a point last year when I was obsessed with butonned denim skirts (see my dedicated Pinterest board). I ordered some fabric for Rosari then (a thick Kaufman denim from Fabric.com) but then I had to move and I forgot about it for a while. 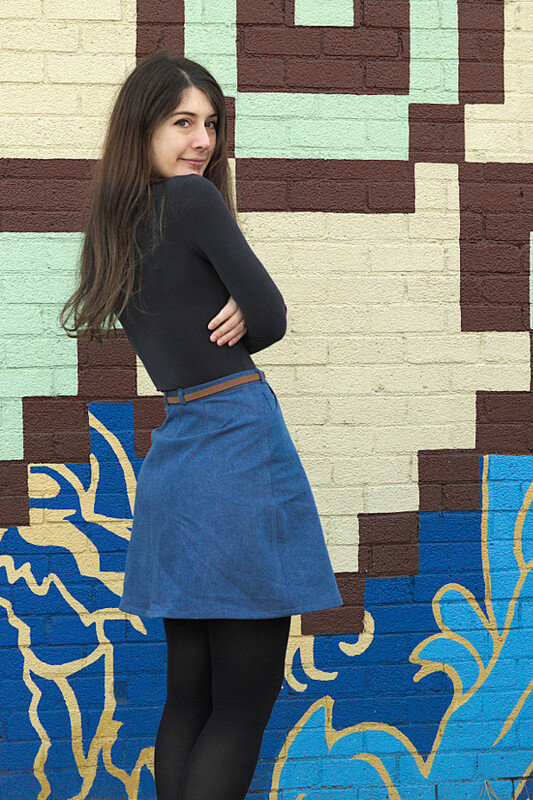 Rosari comes in two lengths (mini and knee-length) and with several pocket variations. 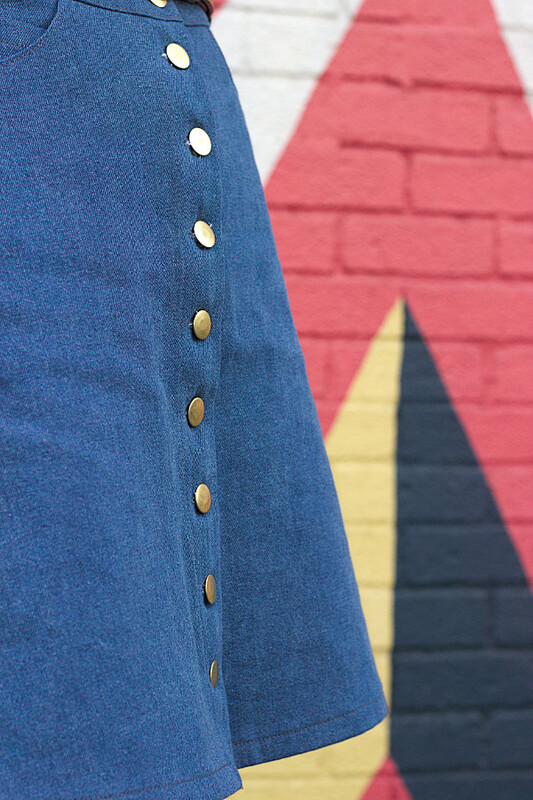 The one that caught my eye was the mini-length with jeans pockets. I did lengthen it by 5cm (2”) to get a finished length of 47cm (18 1/2”), which is about the same as my velvet dress. But even with the additional length it is very short, and I don’t think I’ll wear it much without tights. Still on the topic of adjustments, I tried to pick different sizes for waist and hips based on finished garment measurements and grade between them. According to the chart I needed a size 36 at the waist and 40 1/2 at the hips (consistent with my Deer&Doe sizes of 36 1/2 – 40 1/2), but I settled on 36 to 40 to avoid having to grade over more than two sizes. The result was a disaster: the curve I drew must have been too exaggerated, and I ended up with extra fabric around the hips collapsing in a weird way. I took in what I could after putting the skirt together, but the side seams are still pretty ugly and I cannot unsee it on these pictures. The fit in the back is pretty bad too: it needs some kind of swayback adjustment, or at least some tweaking of the back darts. Here again the pattern is not at fault, I should have made a muslin before cutting into the denim, but I got ahead of myself. Well, I’ll still wear it. Aside from my own fit issues, this pattern was fun to put together. Pauline’s patterns have a lot of smart construction details, such as the belt loops that are sewn as one piece and then cut to measurements, which is a real time saver. I did encounter a problem with the waistband, wich was almost 1cm too short. I confirmed the issue by measuring the pattern: for a size 38 I measured 23.50 (back) + 22.50 (front) – 1.50 (back dart) – 3 (side seam) – 1.50 (center back seam), so a total of 40cm, but the waistband piece is only 39.50cm long. 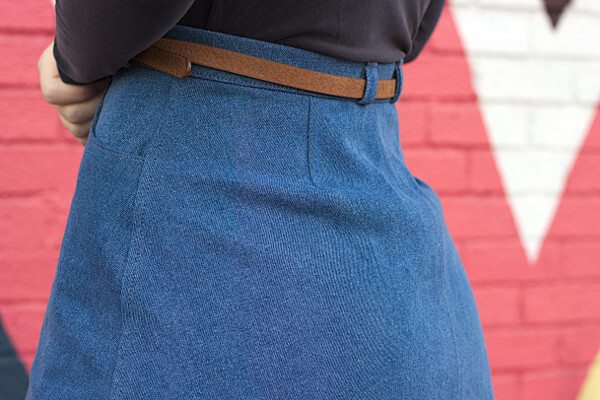 This means the finished garment measurements are wrong, and the skirt actually has less wearing ease than indicated. For instance, for a size 38 it would be (39.50 – 1.50)*2 – 4 (overlap) = 72cm, and not 74cm, so 2cm less wearing ease at the waist! 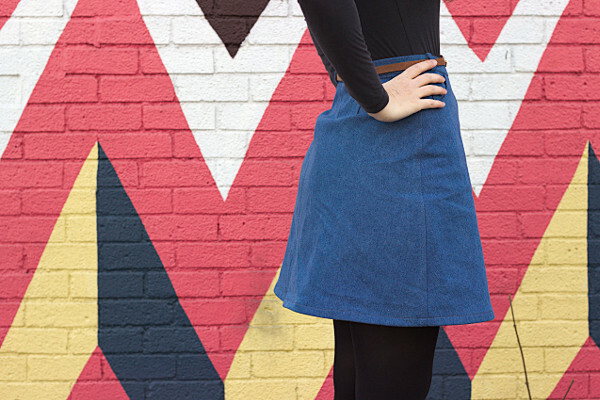 I saw that someone mentioned this problem on GOMI, but apart from this I’m really surprised that nobody mentioned it in the many blog posts I’ve read on this skirt pattern. I did contact Pauline who confirmed that it was a mistake on the pattern piece and told me she would correct the pattern; it hasn’t been fixed yet but I’m betting it will be soon once her new collection comes out. I bought the jeans buttons online from Wawak, and I was pleasantly surprised as they are really cheap and the quality is nice. That said, I hate hammering in jeans buttons! Despite using a towel as a cushion I always end up with a mark on the front of the button. If you have tips to share I’d love to hear them! 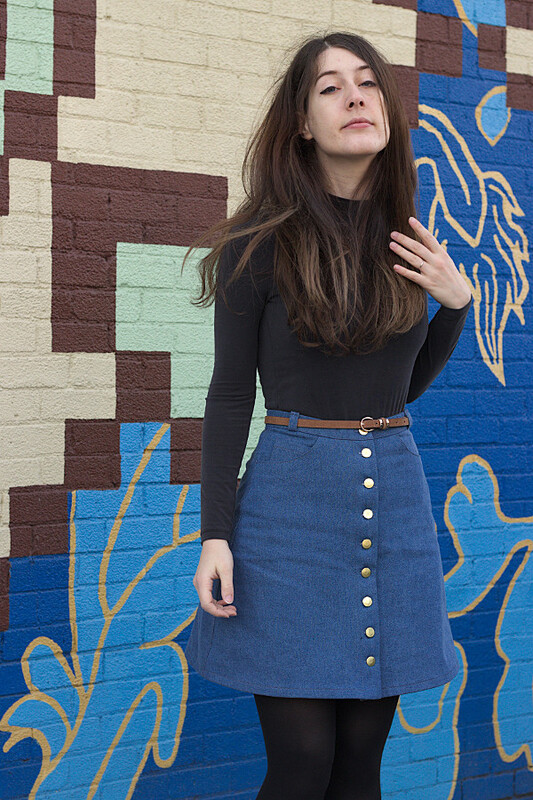 In the end I’m still happy with this skirt, and I’ve worn it several times already despite its obvious (to me) flaws. It’s a great staple piece and I’ll gladly recommend the pattern, as long as one remembers fixing the waistband piece before cutting into the fabric. I can see myself making another one someday. Right now though I’m dreaming of sleeveless dresses in tropical prints, I can’t wait for spring..! Cute skirt from the front, from the side yes there’s the dreaded swayback thing, but hey, I think only we sewers see it:). I have the same difference and know exactly what you mean by the wierd curve. rolleyes…. However, I recently read somewhere that as opposed to the Big four thing of grading at the side seams, in cases where there’s more than a size difference, it is better to split the diff between side seams, darts, and perhaps in this case the CB seam. Less chance of funny stuff happening. 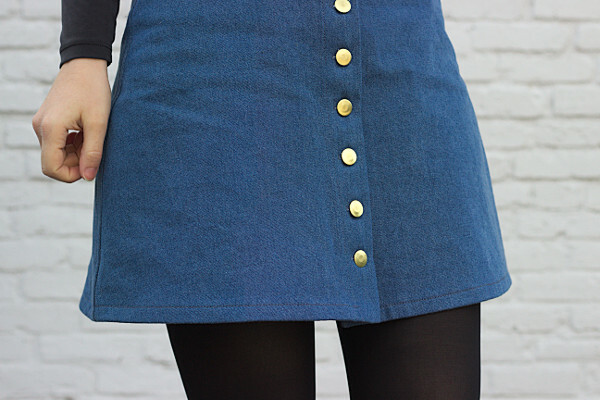 I love hammering jean buttons… I do it on my cutting mat on the floor. 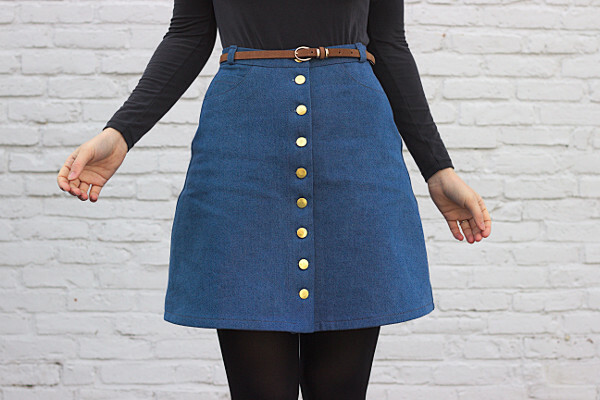 I really want to make this skirt, too! Yours is super cute. I was thinking that you might be able to fix the fit in the back and add the room you were wanting for your hips by slashing and spreading at the back darts and just taking bigger darts to retain the proper fit at the waist. I often do this or a combo of this and side seam grading because much of my hip circumference is distributed to my backside. 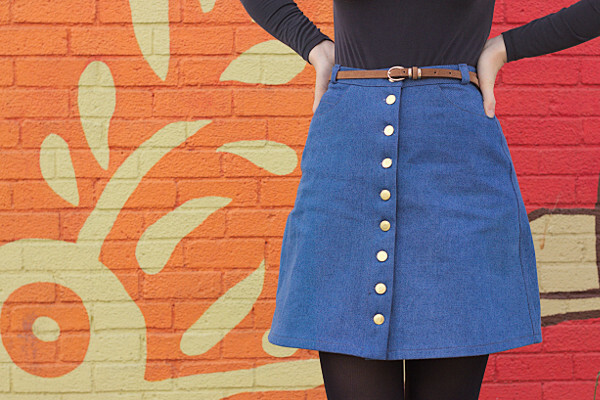 The skirt is adorable. About your fitting issues, have you tried using the larger pattern piece for the back half and the smaller in the front? I know of some sewists who recommend that, as it accounts for what really needs to be accommodated. Oh I’ve never thought of this, that’s a good idea! Wait…**looks around first**…are you…**whispers**…a ham?